Softball and all Cal High sports are self-funded. Without funding, we cannot have a program, as we must not only purchase our uniforms, equipment, and supplies, but must also pay for umpires and field prep on game days, fees to play in tournaments, coach stipends, and more. We ask for a Participation Contribution from every family with a rostered Varsity or JV player, but then must still raise several thousand dollars in addition to these Participation Contributions, to fund and operate the Cal High Softball program. We are always seeking greatly needed donation support to keep our softball program running each year. 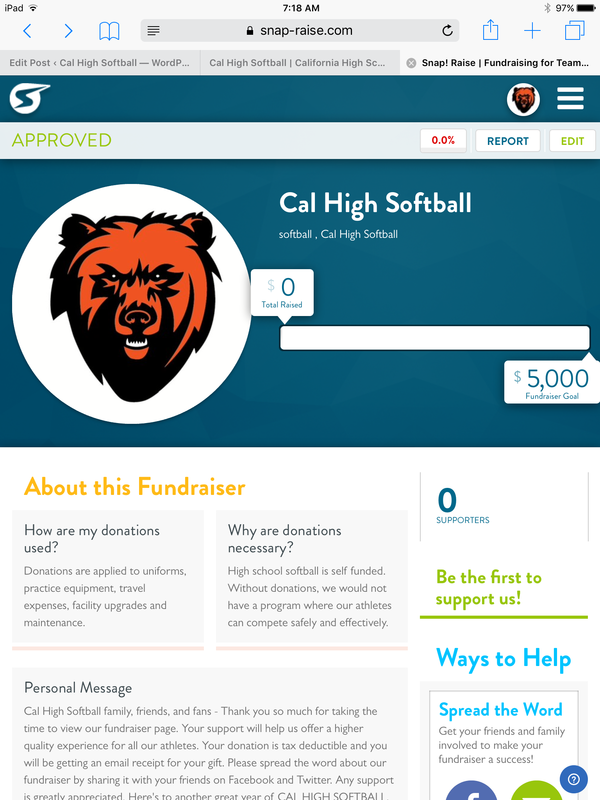 If you are able to contribute, see our donation opportunities below or contact Coach Tony directly at calgrizzlysoftball@gmail.com. On February 28, we began our 2018 Snap-Raise Fundraising Program in an effort to raise at least $5,000, which is the minimum amount needed to supplement the parents’ Participation Contribution for their student-athlete. This minimum fundraising amount assumes the program receives the full Participation Contribution from 100% of the student-athletes on the Varsity and JV teams. The online program ran for 28 days, exceeding expectations and generating $8,400 (net after Snap-Raise fees) for our Cal High Softball program. We plan to implement another Snap-Raise Fundraiser for the 2019 softball season and anticipate it will begin in mid-February 2019. California High School Athletic Boosters offers advertising at select premier campus locations in high traffic areas. Becoming a corporate, small business, or individual sponsor includes a 12-month advertising presence, available in several packages. Bronze Package ($500): Softball Stadium Banner Program, including a 7′ multi-color banner featuring your logo, information, and artwork. Also includes advertising in the Event Center on Digital Scorer’s Table for all Varsity, JV, and Freshman basketball games, volleyball matches, and wrestling matches. Silver Package ($1,500): All Bronze Package items, plus Football Stadium advertising on the scoreboard, including a 3′ x 6′ lighted panel box. All translucent box covers are replaced annually to give a fresh new look for repeat advertisers. Platinum Package ($3,000): 3-years of Silver Package for the price of 2 years, for a savings of $1,500. To get started, contact Bob DeSoto, Cal High Athletic Boosters Corporate Sponsorship Director at 415.699.0391 or bobdesoto@comcast.net.